Tamagoyaki, Japanese omelets, can be found throughout Tsukiji’s Jōgai, Outer Market. Within about a 50 feet meter there are three tamagoyaki shops. Recently some good friends of ours gave us a tamagoyaki from Marutake. Marutake has been in business for over 80 years. It is a very popular shop. The bespectacled son of the owner, Terry Itō, is a famous television personality and his photo is proudly displayed at the shop. The tamagoyaki is on the sweet side, hence the name tamagoyaki. 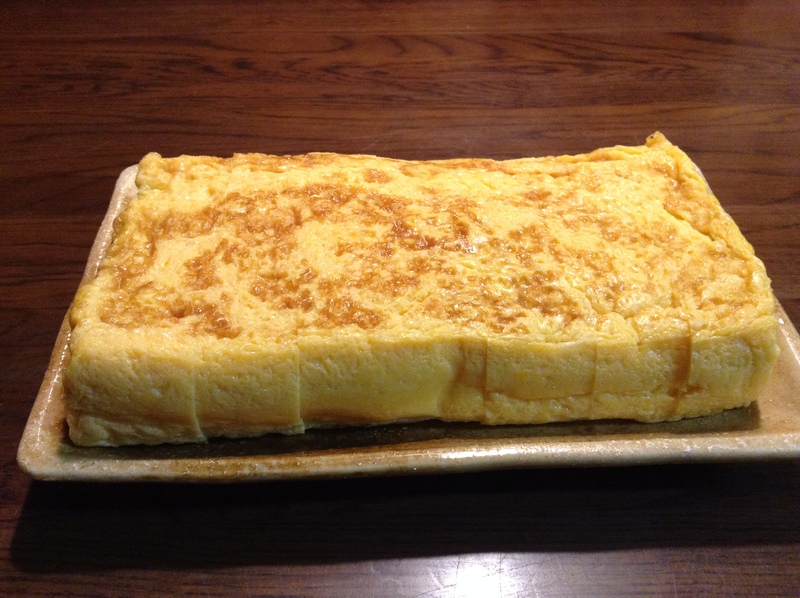 In Kyoto where the savory version is more popular, it is called dashimaki-tamago. At home we make the dashimaki version about once a week, so the sweet style from Marutake was a nice treat. And, has it is sweet, it calls out for something to balance the flavor. We grated some daikon which had a tinge of bitterness to it and topped it with some soy sauce. The perfect side dish for any Japanese meal, breakfast, lunch, or dinner. All the better with a glass of saké. Wow! I didn’t know Terry’s parents own a tamagoyaki restaurant! Amazing 🙂 I want to go! He shamelessly promotes the shop on television. It is actually quite fun to see him support his family’s business. We really enjoy reading your reports on the vibrant Tokyo food scene which we miss. We had an omelet at Tsukiji last September and bought a wonderful pan to make it in back in the US at Aritsugu in Kyoto as discussed in your book “Food Sake Tokyo.” Am perfecting my technique, but not there yet. My wife loved the sake cups you reported on yesterday. Arigato! Good luck making the omelet at home. Glad you picked up a pan! It makes a world of difference. Your wife has great taste. The cups are so lovely to hold as well. 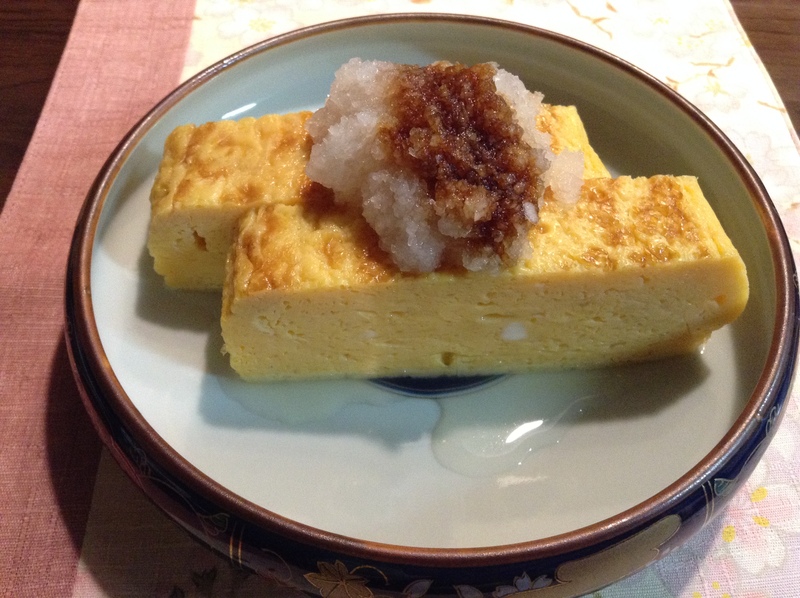 Hello… Would you have a recipe to tamagoyaki/ dashi-maki tamago? Ivan Orkin has a good recipe in his cookbook. I would really love to make this some day, or should I say, make it right! I’ve tried, but after a few epic fails, I gave up! I have been making it for more than 20 years now. Practice makes perfect. And, a lot of oil in the pan helps until you get used to the process then you can cut back.